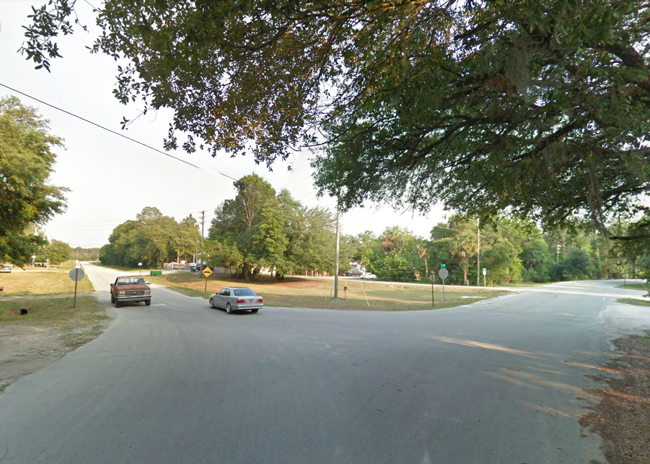 The intersection in Espanola around where the young children were found wandering about, unsupervised, Sunday afternoon. Deputies who responded to the 911 call from a neighbor were distressed by what they found on a road in Espanola, the tiny hamlet west of Palm Coast, a little before 1 p.m. Sunday. Two boys, one of them a year old, the other 2 years old, were wandering around the intersection of County Road 13 and North Old Dixie Highway, unsupervised, according to a police report. A deputy recognized one of the boys from a previous 911 call to the area on Oct. 27, when police were called because a child was roaming around, naked and unsupervised. On Sunday, the boy was pushing a toy car. Neighbors were trying to tend to the children. Four such neighbors told deputies that they’d noticed the children wandering around the streets and the neighborhood for about 30 minutes before one of them called 911. The deputy in the arrest report noted that the area where the children were wandering is “heavily traveled,” because of a three-way stop. Deputies arrived at the scene at 12:52 p.m. Jennifer Prevatt, one of the deputies, noted in the arrest report that she knew where the children lived, because of the prior call. At 1:24 p.m., a deputy noted in the arrest report, Josie-Lynn Walters, 22, stepped out of her home at 3130 County Road 13 and approached the deputy’s car. “I then inquired as to why her children were out in the street unsupervised again,” Prevatt reported. Walters told the deputy she had been sleeping, as she delivers newspapers and works the night shift. Walters delivers papers for the Daytona Beach News-Journal. Walters told the deputy she’d fallen asleep at 9:30 that morning, with the children asleep in bed with her. She had just woken up, she said. She didn’t know how the children managed to keep unlocking the door. Prevatt asked her if, as she was advised to do when cops were last at her home, she’d installed locks on the door at a higher level, to prevent the children from reaching the locks. “Walters stated she hadn’t installed these locks,” Prevatt reported. Walters was arrested on two counts of child neglect, a third degree felony punishable by up to five years in prison, “due to the fact that [Walters’s] children were unsupervised for a known time of approximately an hour and seven minutes,” in unsanitary conditions. 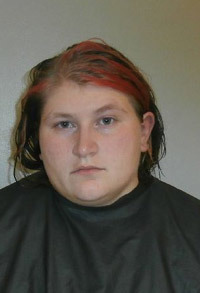 Walters was booked at the Flagler County jail on $2,000 bond, where she remained on Tuesday evening. The children’s case was turned over to the Department of Children and Families. Why would you wait 30 minutes after seeing two babies in the middle of the road? This woman is a danger to her children. I don’t care what sort of job this person has. NO EXCUSES PERIOD! If you’re blessed enough to be able to have children then be proud enough to take care of them. There are absolutely no excuses at all that can be used when it comes to this. Pure laziness. Pathetic.I can’t begin to think of how many times I’ve had the flu or had to work crazy hours it did not matter. You do what you have to do when you’re a parent. I will pray for those kids in hopes they are relocated to a real family with a lot of love! Is there no father or any other relatives in (or out of) the area who can help with these children? These poor little babies. These stories make me so angry. Do you know how many people would love to have kids and can’t? If you don’t want to take responsibility for them, give them up to someone who would cherish them. I would be more than happy to care for them. They would have clean diapers, real clothes to wear and a fenced in yard where they would be safe from traffic. Step up to the plate or do the right thing and let someone else love them. You bring warmth to my heart with your post. I SO agree with everything you said, and I mean everything! Okay seriously people I am really feeling offended. As a parent myself, yes it was neglect and yes it was wrong. But to say that ‘young’ parents should hav to take classes is crazy, and I am 17 years old soon to be 18 in january. My daughter is about to be 6 months, I haven’t taken one parenting class and I’m doing just fine. I pay for everything myself; I’ve moved out of Flagler county to another state ! You people are crazy there are a lot of teen moms who can and will do anything for their children. She was struggling, it doesn’t mean she doesn’t love her kids. Every mother loves their children. Think before you speak. Maybe the children would be better off in foster care until Mom can get her act together, wonder who watches the kids when she is out delivering those papers? Hopefully they can find family first to take care of them before they place the children in a foster home. Does mom lose her meal ticket if those kids go to foster care? She may feel trapped, unable to cope. How hard is it to install locks on the house? You can use the ones in the bathrooms; just switch them out. Maybe we need a pool of volunteers to sit in situations like this, do handyman work to help these moms? Somehow, we have to turn this cycle around. It is becoming all too common. When we were growing up, the neighbors would help. Still true on my street. Not on hers? Maybe I am the controversial one to be very sad for these babies but also for their young, probably inexperienced mom with two unwanted or unexpected pregnancies by a father/s that could only care for the fun of the moment. Where is the father here? She is delivering papers to make a living and working a night shift too somewhere, if what she says is true, sure she is better than others robbing banks like Bonnie (and Clay). Now she went to jail and no only she is loosing her children to betterment for them, but also loosing her jobs for lack of bond money. I can tell you that some of us are very handy and laborious and can change a lock against all odds, but some of us are not, likewise this young mother probably and also lacked the money to pay for it too. Yes maybe she is lazy , that laziness caused by depression that makes her oversleep after a night shift and delivering papers at dawn to make ends meet. Lets see the sad reality beyond these two unfortunate babies….and also their unfortunate Mom. We need to implement a program that every young adult must go through to see . Gqualify to become a suitable and responsible parent. This is getting way out of hand. Really, so I got married at 22 and had my children shorty after. I am a typical stay at home mom that teaches my children everything from manners to their ABC’s. So you are saying that I should have went through a program to teach me to be a parent??? Really?? I find that very insulting! Not every YOUNG parent makes poor choices with their children. Heck it doesn’t matter how old you are it could happen to anyone. I agree with you that the situation is getting out of hand and things like this are happening more and more, BUT those parents that have made a mistake should take the class you are talking about. What we need is to make available programs if only with volunteers and donations, to help these young single mothers trying to make ends meet while caring for their babies!! I mention based in “volunteers and donations”, as our local government cares to waste our taxes only benefitting some of the already wealthy elite. @ Confidential: Programs incur administrative costs. I think we just need to do a better job of volunteering, being more neighborly, reaching out to mothers like this one. The circumstances these babies were in are horrible, but so are her’s. What if she had a pool of volunteers she could reach out to for help? We could do the same for seniors who need a helping hand. In the meantime, if you see a neighbor in trouble, offer a helping hand. I always do help my neighbors and or other individuals that I see need a helping hand. I also help when I can, Pastor Silano’s program of food, clothes and other donations for the needy. If I would have known about this young mother need for a higher moved lock to prevent her boys from reaching it, we would have gone and install one for her at no change…So many things we just don’t know about our fellow man in need. The danger of lawsuits always tampers good intentions.